​with all new furnishings and luxury linens. FREE WIFI!! You will know you have officially arrived in Paradise the moment you step into this immaculate vacation home! If you are looking for a place to spend your Hawaiian dream vacation, look no further. This beautiful 3-bedroom, 2-bath townhome will be your home-away-from-home during your vacation on Maui! The owners have spent countless hours making sure that every detail is just right. Each bedroom has a Queen-size bed, Air-conditioning and ceiling fan. Two bedrooms have Flat Screen TVs. Brand new tropical furnishings and artwork are located throughout the home. Each of the bathrooms has been upgraded to feature beautiful new tile and fixtures. The Washer/Dryer closet was even upgraded and is located in the downstairs bathroom. The kitchen is fully stocked and ready. Amenities include: Air-Conditioning in all bedrooms and living room, Dishwasher, Full-Size Refrigerator, Stove, Oven, Microwave, Coffee Pot, Toaster, Blender and numerous other small appliances to help make meals a snap! Koa Resort has one of the largest swimming pools in Kihei, which can be evidenced by viewing this home on googlemaps.com (811 S. Kihei Rd). There are 5 buildings, consisting of only 54 units, making this low-rise complex a beautiful change from the craziness of the bigger, more crowded, condominium complexes. Our guests tell us how much they enjoy the peace and comfort that Koa Resort has to offer. 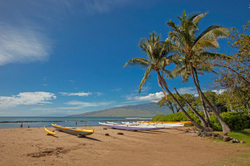 That's just one of the reasons the Koa Resort is one of Maui's hidden gems!